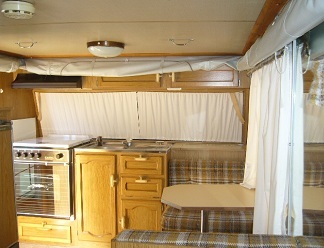 The Caravan sleeps 2 people comfortably and has fully functional gas kitchen. A good sized annex gives a spacious covered area next to the van. This size van is great for weekends or longer trips and is easily towed for those inexperienced travelers or work crews. This caravan is a great alternative for travelers and companies looking for reasonable accommodation in isolated areas or places where accommodation is limited.